Research In Motion (RIMM) reported a net loss for the third consecutive quarter on Thursday, but the struggling smartphone vendor shocked the Street with better than expected performance and its stock jumped as much as 23% in after-hours trading as a result. RIM is still more than three months away from launching its first BlackBerry 10 smartphones, however, and it expects to post another loss for the third quarter of fiscal 2013. All eyes are on the company’s upcoming BlackBerry 10 phones as the potential start to a major turnaround, and company executives are currently touring the world as they try to keep their carrier partners on board. A video seemingly used to showcase RIM’s first two BlackBerry 10 smartphones to carriers leaked just moments ahead of the company’s earnings report on Thursday — what are the odds? 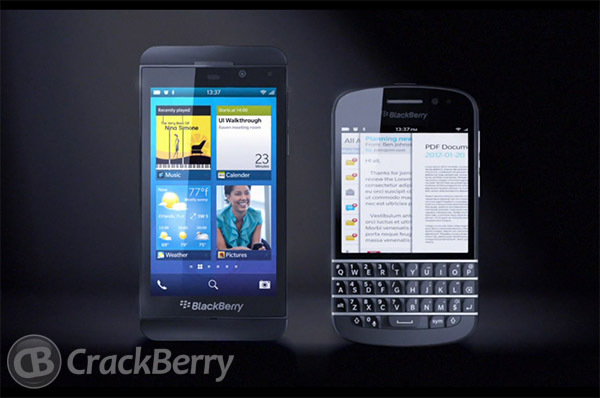 — and it reveals RIM’s upcoming BlackBerry 10 phone with a physical keyboard for the first time. The video, first published by CrackBerry before being pulled from the site, showcases the much leaked “L series” smartphone, which will be the first handset RIM launches next year, along with an upcoming “N series” phone that is pictured for the first time. The device looks like many of RIM’s earlier QWERTY-equipped smartphones but the touchscreen above the physical keyboard is taller than the display on the Bold 9900. RIM on Thursday reaffirmed its intention to launch both devices in the first quarter next year, with the company’s full touchscreen phone set to launch first followed by the QWERTY device at a later date. The leaked video follows below.